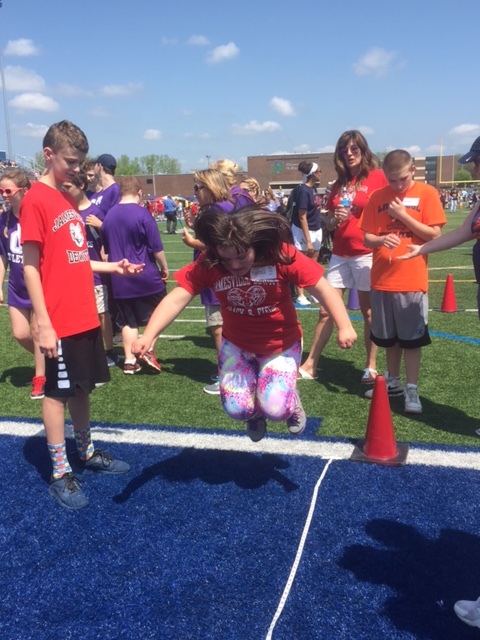 Every spring schools from all around Central New York gather together for students with special needs to compete in the Special Olympics. The Special Olympics provides a place for students with learning disabilities to go and compete in various track and field events. But more importantly, it’s an opportunity for students to go and have a good time. Freshman Tim Beshers has attended the event every year since first grade, and he loves it. Every time it comes around he gets pumped up to bring home some ribbons. “I came in second place for the 200 meter. I came in third place for the high jump. I came in first place for the shot put,” said Beshers. Some other students that went with Beshers were junior Rachel Sartorti, and freshman Selah Ladew. Both love the event just as much as Beshers and won several ribbons, too. Sartori won the shot-put event, and came in second in the long jump. Ladew got second place in the 200 meter, and also won a ribbon in shot-put. Winning the events is always great, but Sartori and Ladew both loved the other activities. The mascots at the event were a big hit, but the cotton candy given out stole some of the mascot’s glory. “My favorite part was the cotton candy,” said Ladew. Along with the competitors, students from Jamesville-DeWitt middle school went to help them, as did their teachers. One of the student helpers was eighth grader Grace Evans. “We walked around with the students and cheered them on,” said Evans. She had a great time there and thought it was a great environment. The students were not the only kind of helpers that went along. There were also several teachers that attended the event. One teacher was special education teacher Jody Smith. Ms. Smith not only helps the competitors at the event, but she also helps them at school. Ms. Smith thinks that the opportunity for the kids to get out of school and have fun for a little is always a great one. “We do the Special Olympics for several reasons,” said Ms. Smith. Some of those reasons are for the students to get a community experience, and that it’s a day that lets the students shine in their events. The Special Olympics is always a great event for kids to go out to compete and have a good time. Beshers, Ladew, Sartori and all the other kids who compete are ready to go out again next year.